There sure is a lot of noise surrounding vaccines for our pets, isn’t there? I don’t blame you if you think it’s confusing. Heck, I think it’s confusing and I’ve been doing it for almost 20 years. How, when, and what vaccines to use in pets is one of the most common questions I get both in person and online. When it comes to the truth about vaccines, here’s the real life, not-so-neat reality: there is no one size fits all answer. But the more we understand the principles behind the recommendations, the better equipped we are to make good decisions on behalf of our loved ones. The immune system is complex, as is the science behind how we optimize it using various vaccinations. Here’s the basic information every pet person needs to understand. 1. Macrophages: These cells are the first line of defense. They engulf infected and dying cells, and save pieces of it to present to the other immune cells. Think of them as first responders. They save little pieces of the invader, known as antigens, as evidence from the crime scene! 2. B cells: These cells produce antibodies in response to the antigen. An antibody is a substance that helps the body fight disease in a variety of ways. For example, it can neutralize the invader, or act like a homing beacon for other types of cells to identify the invaders quickly. B cells are like Dr. Nefario from "Despicable Me" ... they don’t take part in the fight directly, but they produce all the gadgets that help the good guy win the battle. 3. T cells: These cells directly attack infected cells. They’re trained to identify a specific antigen, so it can react quickly to destroy the invader. T cells are the trained assassins of the body, honed in on their target. After an infection is overcome, the body retains some T and B cells specific to that antigen, just in case it encounters it again. In order for those B cells and T cells to react quickly, they must have already been exposed to antigens from the infecting agent. That’s where vaccines come in. 1. Attenuated vaccines: These are live infective agents that have been weakened or altered in some way so they do not cause the actual disease. Distemper, parvo, and adenovirus-2 are this type. 2. Inactivated vaccines: These are whole bacteria or viruses that have been killed so they cannot replicate. The most common vaccines in this category are rabies, Leptospirosis, Lyme, influzena, FeLV, and injectable Bordetella. Because these organisms are dead, they are often combined with a substance to “draw” the immune system’s attention: like sending a flare into the sky. These substances are called adjuvants. Vaccines in this category are, according to some, the most likely to cause an adverse reaction. 3. Toxoid vaccines: These are a detoxified toxin - these are not actually in response to an infectious agent at all! Rattlesnake vaccine is the most common example. 4. Recombinant vaccines: These vaccines represent a new generation of vaccine technology. They take a piece of DNA or RNA from the infectious agent and insert it into a benign live virus that will not cause infection. Because the organism is live, it triggers a nice strong immune response without the need for adjuvant. If your cat has been vaccinated with adjuvant-free Purevax, then you’re familiar with this type of vaccine. How often do we need to re-vaccinate? Well, here’s where it gets tricky. Some vaccines last longer than others because of the nature of the infection itself. Or, the exact same vaccine may last longer in one individual than in another. I have a colleague who needs a rabies vaccine every three years; mine lasted 20! There is no guaranteed answer. So, what do we do? We make recommendations based on minimizing the number of vaccines while maximizing the level of protection for animals taking into account the wide variability in response. The American Animal Hospital Association assembled a gold star panel of the world experts in immunology who make, in my opinion, the most informed recommendations for dogs. The American Association of Feline Practitioners has done the same for cats. These are guidelines that are tailored to your pet with help from your veterinarian. When you talk to your vet about what your pet needs, you balance risk versus benefit for the individual. You look at lifestyle, likelihood of exposure to diseases, severity of those diseases, current health, and vaccine history. The two most important factors are risk and health history. Risk: Not all pets are at equal risk for disease. A pug who lives in a skyscraper in San Francisco is not at the same risk for certain diseases as a hunting dog in Louisiana. Health History: A healthy one year old who is just finishing up their initial vaccine series has different needs than a sixteen-year-old diabetic who has been vaccinated on time her whole life. A sick pet, one with a history of reactions to vaccines, or one with a history of immune mediated disease will have different recommendations. The exception is rabies, a disease that kills both pets and people. Most jurisdictions have mandated rabies vaccination guidelines written into law. Titers are, for those willing to pay for them, a decent (but not foolproof) way of feeling out a pet’s immune status. Titers check for circulating antibodies to a specific disease. Remember when we were talking about B cells and T cells? Titers only tell you about long term B cell response. A pet with a high antibody titer may still be bottomed out on T cells, and vice versa. It’s only part of the picture. It’s not a guarantee that a pet is protected, but it gives you more information to make an informed decision particularly when it comes to how often to boost vaccines in an adult animal who already has several boosters. What about half doses for smaller pets? It’s tempting to think of vaccines the same way that we do drugs, whose efficacy is dependent on the concentration in the blood. Not so with vaccines. Vaccines work more on an all-or-nothing proposition: either they get the body’s attention, or they don’t. The degree of the response is determined by the body’s production of those T and B cells. This is the same as in human medicine: my kiddos get the same volume of flu vaccine as my husband. It’s not worth the risk to gamble with a vaccine not working, with no proven benefit. It’s challenging to dilute a textbook’s worth of information into a single blog post, but hopefully this gives you a little background for your discussions with your vet. Vaccines, nutrition, weight control, exercise ... lots of moving parts come together to help ensure the best health outcomes for your pets. The best decisions are those you make with your trusted health care providers as a team! In recent years, there's been growing confusion over the necessity of vaccinations. It's unfortunate, because they play a key role in the health and longevity of companion animals. Dr. V shares her insights on this timely topic. Does your dog have her own dedicated Twitter following? Is your cat a fabulous Instagram star? Do you find yourself skimming the trades to make sure your puppy or kitten will have the freshest, from everyday chic wear to the slickest tech toys? If so, trends are def your thing. 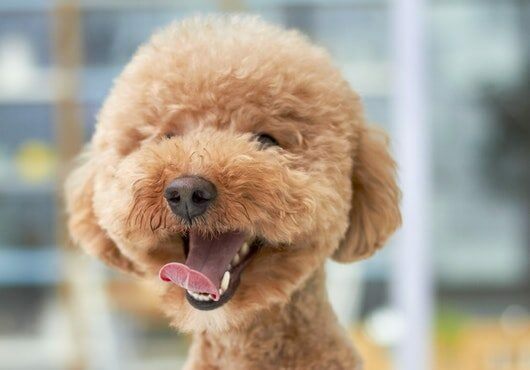 Now that 2019 is well and truly underway, we're taking a closer look at pet trends for the coming year. Specifically, we'll check out four distinct areas: smart tech, alternative health, special diets and emotional health. So, without any further ado, let's check out what's hot and what's not for doggos and kittehs for the immediate future. To view the full-size PDF, simply click on the image below. And be sure to share this handy infographic with other like-minded pet parents, too! We're taking a closer look at pet trends for the coming year. Specifically, we'll check out smart tech, alternative health, special diets and emotional health. Most people who have a dog love their dog. Unfortunately, sometimes that love falls short of actual empathy. For example, many of the "problem dog behaviors" that people complain about aren't really your dog's fault. If someone you know keeps getting "bad dogs," chances are that the dogs aren't the source of the problem. By showing your pupper a bit of empathy by viewing recurring issues from their perspective - both physically and mentally - you will develop a deeper appreciation and love for your furry companion. And that translates into a happier dog ... and a happier you! Dogs are so much more than most people know. Like humans, dogs produce oxytocin, which allows both species to experience love and affection. Canines also have highly evolved limbic systems - more advanced than the majority of other species and comparable to humans - which enables them to experience a range of higher emotions, including an appreciation for beauty and something akin to religious ecstacy. 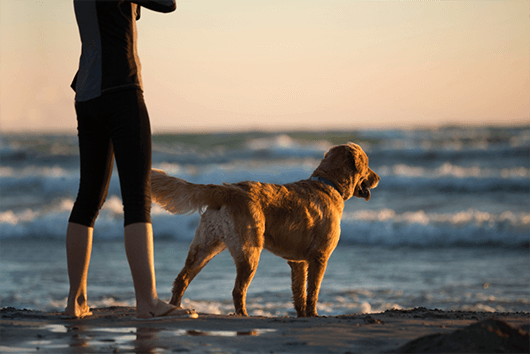 If you've ever caught your dog gazing at a sunset or drinking in the beauty of nature, such meditative moments are caused by flares of limbic activity. The most important point about dogs is that they are pack members. This is one of those facts that everyone knows but hardly anyone ever considers when trying to understand canine behavior. Imagine how confusing it is for animals with a genetic predispostion towards a pack mentality when you - the de facto leader of the pack - don't exhibit pack behavior! Your dog's socialization instincts are very strong. Pack hierarchy was established millions of years before domestication (search for "Tomarctus," "Miacid" and "Cynodictis" for more details about the ancient progenitors of modern dogs). Humans and dogs began living together starting around 30,000 BC, so there's a long history behind the "man's best friend" descriptor. Because you provide food, shelter, affection and fun, you are the de facto leader of the pack. That's why it's so vital for you to understand how this should inform your interactions with your pup! To get you started on this journey of understanding, here are three examples that frequently crop up for pet parents. He Stares at Me Every Time I Eat! From pitiful, longing looks to grumpy growl grumbling, dogs all over the world appear to be begging to eat the food on your plate, much to our annoyance. While he may find the smell of your food super appealing, that's not the primary take-away from this behavior. So, what is he trying to communicate? Let's put on our "pack mentality glasses." As social creatures, dogs view mealtime as a social event. As top dog, you are responsible for fairness at mealtime. But when you - and other human family members - partake, your dog feels left out. Punished even. So, in a sense, they are begging ... only they're begging for inclusion. If at mealtime, you provide them food or a healthy treat, then suddenly your dog not only feels included, they also no longer feel ostracized. Try it for yourself and see if everyone isn't happier! She's Just Scared of Everything! Again, dogs are sensitive social animals. Recent MRI studies show that dogs are capable of complex emotions and reading the emotional state of their caregivers. When people express anger or annoyance - whether it's at the news, a bad day at work or problems with a spouse or partner - dogs are highly attuned to that. Frustration on your part over skittishness or anxiety will likely only exacerbate these very issues. Whether you realize it or not, you're setting the tone for everyone else in your home. If you're quick to snap, your dogs will be anxious. For the wellbeing of your pack, be careful about the emotions you project. He Keeps Chewing Up My Shoes! This one is so common, it's hard to find someone who hasn't experienced the heartbreak of losing a favorite pair of shoes. Sadly, many feel their dog was being vindictive and dole out a harsh punishment. First of all, canine memory works differently than it does for us. Shaking a slobbery, mangled shoe at your pupper is really going to baffle them, especially if it's been more than 20 minutes since it was destroyed. So, what are dogs trying to tell you when they chew up your shoes? This question is answered best with another question: what is the last thing you do before you leave the house for an extended period of time? You put on your shoes, right! Your dog believes - with evidence gathered basically every day - that destroying your shoes will prevent you from leaving the house (i.e., the pack). He's really not being a jerk, he's just trying to keep you where you belong ... with him! To avoid this happening, simply protect your footwear with a dog gate. There you have it. Three simple examples of "problem behavior" that can be understood in a completely new way that's more charitable to your dog. Just remember that you're the leader here and your dog looks to you (often lovingly) for reassurance, consideration and safety. 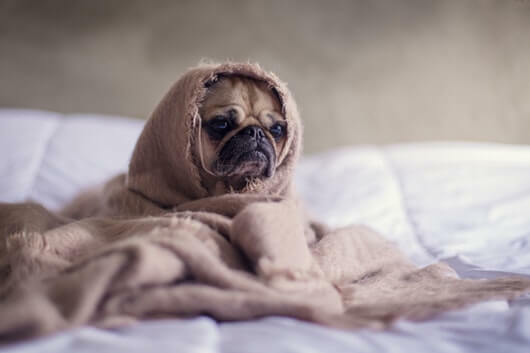 We're very interested to know if this article leads you to reconsider some aspect of your dog's behavior, so please let us know your take in the comments section below! Sometimes dogs exhibit behaviors that are baffling or irritating. But the reasons for such behavior are more profound than many believe. By understanding how a pack mentality informs your dog's behavior, both you and your dog could be happier! Why is My Dog So Nervous? My neighbor’s dog Chuckie is, by all accounts, an anxious canine. Sweet as can be, but nervous. Chuckie hides behind his mom when new people show up. He still doesn’t trust his dad, who is the one who lobbied so hard to bring Chuckie home in the first place (three long years ago). He runs away from him and wedges himself under a table whenever my friend's husband looks at him directly - about which the poor guy feels rather despondent. When a dog is this fearful, many people assume that at some point he or she has been abused. It’s the catch-all people use whenever a dog whose history is unknown shows stress or fear. We say, “He’s scared of men so he must have been abused by one." Or, "She’s scared of ballcaps, so she must have been abused by someone who wore one.” The same sentiments are expressed for men with beards, people wearing sunglasses, pulling out a camera, you name it! It would be horrifying to think that every dog who exhibits fear (chiefly because there are a lot of them) do so out of a direct result of abuse. While it certainly happens, and it's terrible when it does, a much more likely and less harrowing explanation is that these dogs may not have been adequately socialized as a pup. 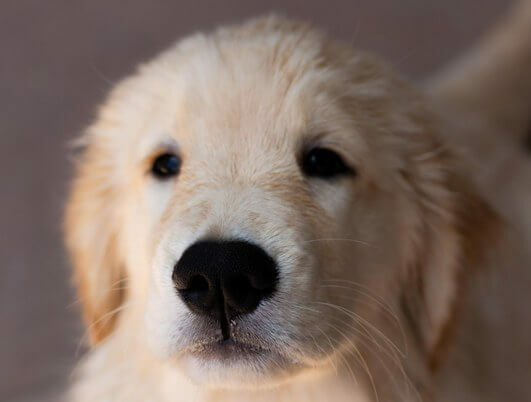 After puppies are born, a great deal of neurological development takes place, much of it occurring in the first 16 weeks. Their early experiences in this crucial time make a lifelong impact on their ability to react to stress. During this period, they are most open to new experiences, sights and sounds. From vacuum cleaners to cats to children (and, yes, men with beards wearing sunglasses and baseball caps), a dog who has a positive experience with these things during this critical time is much less likely to react negatively to them down the road. Most puppies go to a new home at eight weeks at the youngest, ideally even a little older than that. Back when I started out in veterinary practice, vets were trained to advocate from a health standpoint: keep puppies at home and away from potential sources of illness until they are fully vaccinated at 16 weeks. Unfortunately this "common knowledge" means pups may be missing out on some key socialization time. 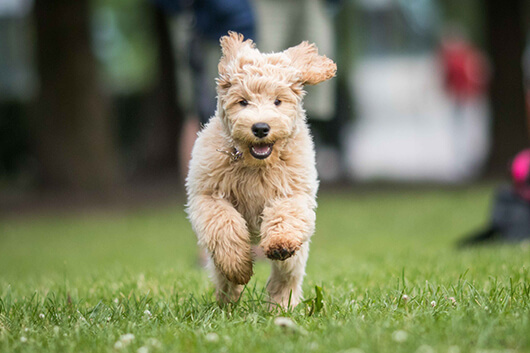 As our understanding of the importance of socialization has increased, many trainers are opening up puppy classes to 12-week-olds and veterinarians are re-evaluating the four-month quarantine rule. Each of us needs to assess the risk/benefit analysis of taking puppies out into the world, but in a controlled environment around dogs who are healthy and up-to-date on vaccines, many of us find the socialization benefits are well worth it! When Dakota came home with us, he was 14 weeks old. He spent his early weeks in a house with nine adult dogs and all of his littermates, which was quite chaotic. But, it led to him being super comfortable meeting new pups. Before coming home with us, he had already gone home with an elderly couple who returned him after a couple days when the reality of living with a puppy set in. So he had been exposed to quite a lot! Nonetheless, as he was current on his preventive care, we also attended socialization classes from the get-go. Based on his reactions at the door, it’s clear he was never exposed to men in UPS uniforms, but we’re working on it. When talking to friends who are experienced breeders, I learned there are several formal programs you can use to socialize puppies at the very early stages of life (aka, “puppy preschool"). These programs are great because they walk people through each important aspect of social exposure needed for good socialization, from touching to meeting strangers, to music and doorbells. In fact, the breeder we are getting our next Golden puppy from is doing it as we speak, and started when the litter was only one week old! And yes, that is my way of saying I am bringing another puppy into the house this summer, which is insane but at least I will have lots to talk about here on the blog! As for Chuckie, his family has come to love and accept him as he is. That isn’t to say that dogs can’t change or improve after 16 weeks of age has passed! I often see Chuckie walking to the dog park with the husband, who learned that when Chuckie is in the presence of other dogs he also relaxes more with people. Their patience and love has helped him adjust and modulate his fear, even as an adult. Have you ever used a puppy kindergarten training program with a new litter? Do you think it helped? What have you done to diminish your dog's outsize fear? When a dog is super fearful around certain stimuli, many people incorrectly assume that it's related to previous abuse. But that’s not what’s typically going on. 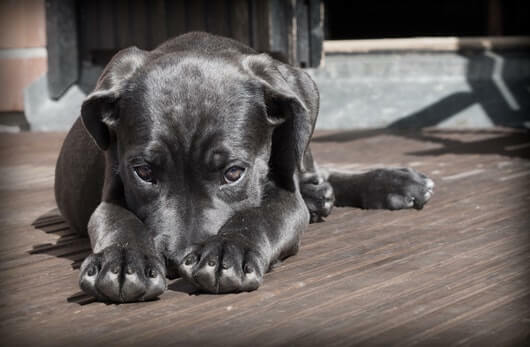 Find out why your pup is so nervous! 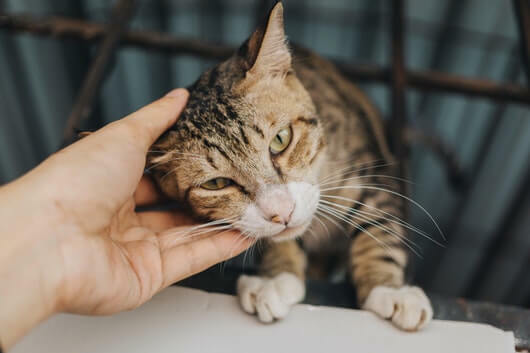 If you haven't had much experience with cats, or if you want to teach your kids how they can be affectionate without worrying about getting scratched, we’ve got the inside scoop on how felines want to be petted. So, what’s the correct way to pet a cat? You may think, no one needs to tell me how to do a simple thing. But the truth is that petting a cat isn’t something you can do by intuition alone. If you’ve never had a close relationship with a cat, maybe because you had a bad experience before, don’t worry. We can help you change all that with a short tutorial. Simply follow the guidelines below and you too can begin to know the joys of feline companionship. If there’s one rule to keep in mind, it’s that petting a cat is very different from petting a dog. While dogs usually love a good belly rub, cats typically do not. Why is this true? It boils down to psychology. Generally speaking, dogs are usually pretty secure in their identity as a predator. You may even know of a few tiny dogs who believe themselves to be big bad wolves (looking at you Chihuahuas and Terriers). However, cats are more cautious, because in the wild, they identify as both predator and prey. That’s why cats remain on high alert much of the time. If a cat feels threatened – like when someone they don’t know unexpectedly touches their soft underbelly - he will act defensively to protect his vital organs. Better you than him, he would say. So, the secret spots where cats enjoy being scratched are where a cat’s scent glands are located: in the cheeks, the top of the head and at the base of the tail. When a cat rubs against a piece of furniture or your leg, it’s referred to as bunting. Bunting is how a cat spreads his scent. It’s his way of saying, “Hey, I like you and want to include you among the things that make me happy.” Bunting releases pheromones, making objects – or people - in his environment smell familiar. It also has the added benefit of reducing stress! Around the head is a sure-fire hit with most kitties. 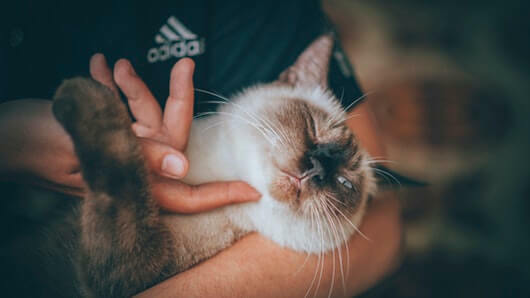 Rub your cat along the crown at the top of the head, gently under his chin, in front of the ears and cheeks behind the whiskers. Hit this last spot just right and your cat will actually rotate his whiskers forward, indicating interest and friendliness. With cats, it really pays to be observant about how each individual responds to different kinds of touches. Most cats like it when you run your hand along the spine. Some even enjoy gentle pressure at the base of the tail. In fact, they’ll let you know by sticking their tails straight up. If you notice any growling or tail-swishing, these are clues that your cat is becoming overstimulated and may lash out. For cats with heightened sensitivities, it’s best to stick with gently scratching their head and neck. We hope you find these tips helpful for tuning you in to your inner cat nature, and that you too will now feel completely at ease with all kitties. Some people just have a knack for attracting the affections of cats. Others, not so much. 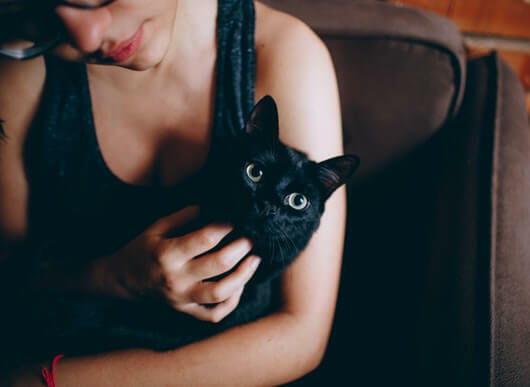 If you’re in the latter category, check out our tips for petting cats. Celebrate National Pet Dental Health Month! There is a reason why an entire month is dedicated to spreading awareness about the oral hygiene of our dogs and cats: it’s an easily remedied problem with potentially dire consequences. So, every February, we celebrate National Pet Dental Health Month in hopes that we’ll reach pet parents in a way that results in a change. According to the American Veterinary Dental College, 80% of dogs and 70% of cats will need dental care by age three. This is often due to genetics, neglect or poor diet. Sadly, tooth and gum problems in domesticated animals are nothing new. In fact, two Ancient Egyptian fossils of cats showed signs of tooth decay! Does My Pet Need a Dentist? According to the American Dental Association, almost 80% of adults brush their teeth daily. And on top of that, it is natural for us to schedule professional cleanings into our annual calendar. Why should the standard be any less for our precious companions? Breath: When your pup swoops in for a kiss, do you detect a foul odor? Unhealthy-smelling breath is a good indicator of the presence of unfriendly bacteria in your pet's mouth. Teeth: Lift the lip and inspect the teeth. Are they healthy white or are they coated in a brown film? If it's the latter, it means your pet is long overdue for a cleaning. Gums: Color should be medium pink, although some dogs and cats will have black or gray spots on the gums, which is normal for some breeds. If the gums are bright red and angry looking, that could indicate a serious problem. If you detect any of these warning signs, your companion animal would greatly benefit from a veterinary dental screening. But why wait for warning signs? Why not be more proactive? The combination of routine home checks, regular veterinarian checks and a quality diet could go a long way towards ensuring your pet's lasting dental health. Believe it or not, the shape of your pet's head (particularly the size of his or her muzzle) affects tooth alignment. And why is tooth alignment important for dental health? Well, perfectly aligned teeth naturally push food particles away from gums, while poorly aligned teeth can result in plaque buildups, possibly leading to an increased chance of infection. While poor tooth alignment is typically a genetic issue, a pet's activities can also result in alignment problems. For example, tug-of-war games with towels or ropes played often over the course of years, can move teeth from their normal position. Therefore, you might want to limit such activities. We're incredibly pleased to announce that starting February 1st, Life’s Abundance will be celebrating National Pet Dental Health Month with exclusive savings on select products. This is the perfect occasion to try something new and integrate it into your dog’s dental care regimen. Throughout the entire month, Gourmet Dental Treats for Adult Dogs, Buffalo Bully Sticks and Porky Puffs are available at their discounted Autoship prices ... up to 18% savings off retail! There's never been a better time to provide your dog with yummy, nutritious treats that can actually help to maintain a healthy mouth. There is a reason why an entire month is dedicated to spreading awareness about the oral hygiene of our dogs and cats: it’s an easily remedied problem with potentially dire consequences. Few feelings of dread are as harrowing as the moment you realize your dog is missing. Late Sunday afternoon, our long-time employee, Dawn Tate, experienced just such a moment. 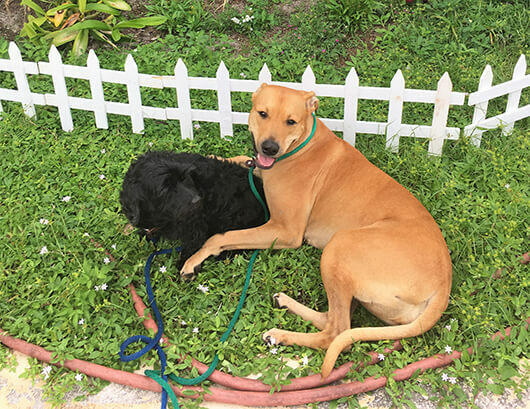 After hanging out with her two dogs, Chevy and Koko, in an open field near her home, Dawn realized that her Florida cur, Chevy, had not returned from her recent romp. Minutes later, as Dawn’s searches became more and more frantic, she realized that Chevy had vanished. After a several minutes of fruitless searching, Dawn launched a full-out rescue attempt. Not only did she contact her local Animal Control Department, but also the police. Both agencies expressed concern for Chevy’s welfare and were only too happy to receive her emails with photos of Chevy, so they could keep an eye out. In addition to contacting the authorities, Dawn turned to social media for help. She posted images of Chevy and shared her last-known location with her friend network. Unfortunately, there were no sighting reports of Chevy. Dawn was determined to bring her baby home, searching the surrounding areas as late as 2 a.m. and then was up before the crack of dawn to resume search efforts. Thanks to a helpful friend, Dawn decided to try a recovery strategy that someone shared online. It’s a method that’s popular among outdoorsmen for lost hunting dogs. The trick is this … return to the location where you first became aware you were separated from your canine. At the scene, place at least one article of recently worn clothing (not anything freshly clean from the wash). The more scent it holds, the better. If at all possible, also bring along a crate or carrier and two or three of your dog’s favorite toys. It is recommended that you also provide a bowl of water (not food, as it may attract wildlife that might scare off your dog). You might also consider leaving a note for any people who happen by, requesting that the items remain undisturbed and why. The basic concept here is that your dog wants to return to you, he just can’t find you. Thanks to their incredible sense of smell, they will be able to find their way back to these familiar items. Time and time again, this method has proven highly successful in reuniting lost dogs with their caretakers. Why is it so effective? Dogs have an amazingly keen sense of smell. Their noses possess up to 300 million olfactory receptors, which is 50 times more than humans. To convert all of the sensory data picked up by these detectors, there’s a great deal of processing power. The canine brain allocates 40 times more brain power proportionately, compared to people. It’s hard to quantify exactly how much better a dog is at detecting scents compared to ours. Some experts say it’s a 1,000 times better, while others say it’s one million times better. And humans actually have well-developed sniffers. All of us have had the experience of returning home and opening the front door to smell that someone’s been cooking. You were probably even pretty sure what dish was being made. If we can smell this, a dog could detect the same in a house the size of an average-sized city! It was a frightening 24 hours, both for Dawn and for Chevy. But thanks to the innovative strategy we just explained to lure her back to the exact spot where they were separated, Dawn, Koko and Chevy are now safely back under the same roof. Yay! Have you ever become separated from your companion animal? What strategy did you use to search, and were you successful? We’d love to hear about your experiences. Share your stories in the comments section below! August 26th marks National Dog Day, giving us ample opportunity to celebrate everything we love about dogs. To honor this special day, Dr. V shares her personal observations and some truly amazing facts about why Americans love dogs so much. It is perhaps fate that I was destined to consider myself a dog person … after all, my birthday falls on August 26th, National Dog Day. From the first time I held my floofy little Lhasa Apso puppy in my arms when I was seven years old, I knew that I felt a special camaraderie with canines. Often, I felt more comfortable with them than I did with people. I thought I was a weirdo for feeling that way, until I met other dog people and realized it’s just who we are. Dogs have always made me stop in my tracks the way my friends stopped for babies. Don’t get me wrong, I love children. But I’ve never felt compelled to stop a stranger and ask to pick up their baby the way I have pretty much every puppy ever. I look at them and see patterns: the way their coat so often matches their caretaker’s hairstyle; the easy way a dog will run up and comfort someone without a word being said; the sudden brightening in children's faces when they first see their dog after a day at school. The easy bond between people and pups has been thousands of years in the making. 1. Family. 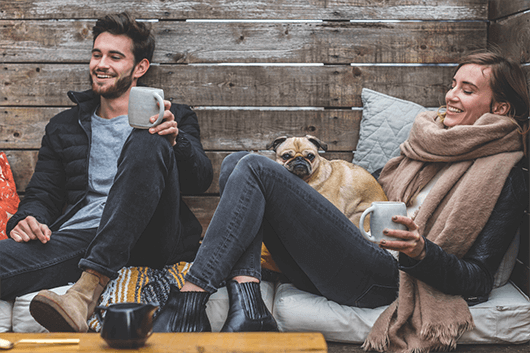 Dog lovers often share that their dog feels like a member of the family, as opposed to a roommate who just hangs out, eats a lot, and makes a mess. This deep bond explains why many people say that the death of a dog is just as hard emotionally as losing any other family member. 2. Personality. With 190 recognized dog breeds and countless lovable mixes, dog personalities are as varied and unique as we are. 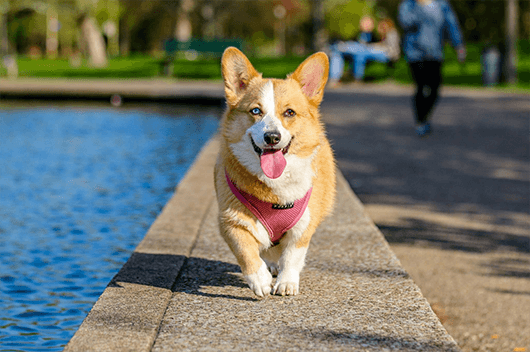 People often spend a great deal of time researching, visiting breeders and shelters, and getting to know different dogs before finding the one whose temperament, activity level, and size are the exact right fit for them. 3. Loyalty. A dog’s loyalty to his or her family is unmatched. As pack animals, they truly depend on us for all the necessities of life plus lots of love and interaction. In return, we are rewarded with boundless love and a friend who doesn’t care about morning breath, what we look like before our first cup of coffee, or what we sound like when we sing in the shower. 4. Understanding. Many of us intuitively sense that our dogs understand us, but does the science back it up? Researchers in Brazil and the U.K. studied a group of dogs and determined that dogs could correlate the tone of our voices with the expressions on our faces. * Up until this study, that particular cognitive ability was thought to only be found in primates! Turns out that dogs often have a better read on us than we do on one another! 5. Forgiveness. A friend recently recalled an incident when she had accidentally closed a door on her dog’s tail, whereupon she burst into tears. Seeing this, her dog immediately ran over to comfort her! His concern was not over his own well-being, but over his guardian’s distress. While dogs exhibit so many wonderful traits we value in each other, they seem to be missing some of the really ugly ones we humans sometimes suffer: greed, malice and holding a grudge (to name a few). They live in the moment, and never seem to hold our failings against us. So amazing! When I speak about the most profound moments I’ve shared with my dogs, I often get choked up. Like even right now. Even in our worst moments, they provide the comfort of a loving presence that’s continually by our sides, without judgment. All they ask in return is a warm bed, nourishment and loving scritches. I think members of Team Dog will agree, that’s a small price to pay for one of the most joyful relationships a person can have! Why are you a dog person? Share your reasons why in the comments section below. 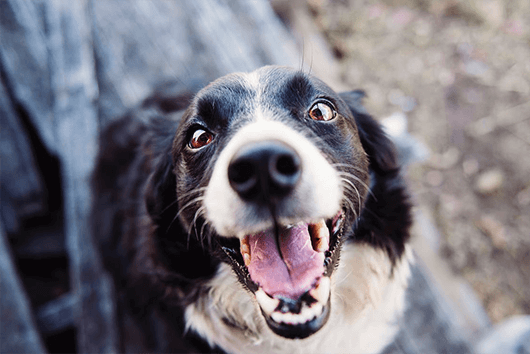 To honor National Dog Day, Dr. V shares her personal observations and some truly amazing facts about why Americans love dogs so much.